Chen during the second round of the Augusta National Women's Amateur. Prior to this week's 83rd Masters Tournament, history was made at Augusta National Golf Club as the Club crowned a female champion on its grounds for the first time with the inaugural Augusta National Women's Amateur Championship. An international field of 72 women amateurs took part in the event, with the leading 30 players following the opening rounds at Champions Retreat battling for the title on Augusta's revered grounds. 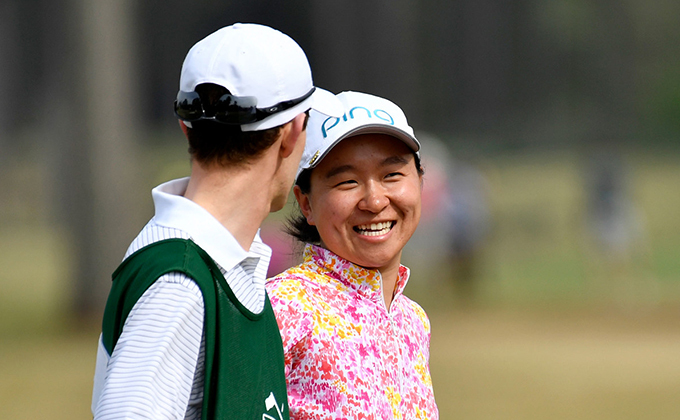 New Jersey's Alice Chen was part of the history and shared with the MGA her insight and reflections on competing in what will stand as another grand tradition at Augusta National. Glorious. Pristine. Hospitable. Once in a lifetime. These are words that describe my time at the Augusta National Women’s Amateur last week. The word glorious comes to mind because there is so much glory surrounding the hallowed grounds of Augusta National. I even teared up as I walked down #11 towards Amen Corner and it was just even more beautiful than I ever imagined it could be. Pure magnificence. It was so cool to skip a shot across the water on #16 and hit the famous Tiger Woods chip shot, and also take a peek [on #10] where Bubba had that iconic wedge draw shot. Glory was all around us and it was really special to hit some great shots of my own. They led to a three under 69 with five birdies, including one on number 12 - which is my favorite hole. Augusta National was pristine as expected. Not a blade of grass was out of place, but even Champions Retreat was so pure. The golf course was in incredible shape, the greens were smooth and rolled true, and the patrons who came to watch and cheer us on were really classy and supportive. We played our first two competitive rounds at Champions Retreat and then the top 30 made the cut to compete and play the final competitive round at Augusta National. I unfortunately did not have my best week so I only got to play the practice round but I’m already looking forward to what’s ahead and I’m forever grateful for the experience. All the patrons and fans were so kind to us, and so was everyone who ran the tournament. There were so many hands on deck and every time that a request was made by me or another girl the answer was always “yes.” It was amazing, I felt like we were royalty and it was such a relief for everything to be taken care of. For example: My bag didn’t have a rain cover to go on top of my golf clubs, so someone from the pro shop at Champion Retreat just took a rain cover out of a new golf bag and gave it to me. I did eventually give it back, but I don’t think that they were expecting me to. There was so much organization and work that went under appreciated, but it was not unnoticed. We can all learn something from the staff of the Augusta National Women’s Amateur. We should aspire to be as kind and intentional as the people who worked this event. If we looked people in the eye when we had conversation and made others feel seen, heard and taken care of, we would all make our circles of influence a better place. I praise God for this opportunity because I could not have scripted a better swan song to my amateur career. On my last hole in the second round at Champions Retreat (which was my final round because I had already known that I missed the cut), I bombed my drive and hit a really solid 3-wood to the back of the green of 18, which is a par five. I hit a really great downhill, double-breaking 60 footer to 3 feet and I made the uphill, right-to-left 3 footer for birdie on my last competitive hall as an amateur. The next day, I played my last round as an amateur at Augusta National and that’s when I shot 69 to close it all out. Very few people get to play Augusta National, and even fewer people get to go around the course and take as many pictures as they want of the course with barely any people there. And then, after they’ve played 18, do they get to meet Condoleezza Rice, Diana Murphy, and Annika Sorenstam. It all sounds like a dream and that was literally my day on April 5th. The week was a dream. I got to share this experience with the people I love most and it will be a week I remember for the rest of my life. I’m taking a lot of positives from my golf game and I’m excited for my professional career to begin as I also stay true to myself: pursuing excellence, loving people, praising Jesus and giving God all the glory because He is worthy.